Katie Kratzer-Smith at CrossFit Loft. CrossFit Level 1 Certificate Courses: Reebok CrossFit One, CrossFit Sierra Nevada, CrossFit Jääkarhu, CrossFit Max Effort, CrossFit Mayhem, ZooTown CrossFit, CrossFit TNT, CrossFit Basel, Reebok CrossFit Officine, CrossFit LCS, CrossFit 2725, CrossFit Effects (FX), CrossFit Life Performance, CrossFit Singapore, CrossFit Posto 9. CrossFit Level 2 Certificate Courses: CrossFit Strong, CrossFit Monrovia. CrossFit Competitor Trainer Course: CrossFit GVA. Fiona Yap at CrossFit Melbourne. Alastair Braddock and Liam Roberts at CrossFit Dux. Virtuosity in Photos: Call for Submissions. "A recent study that said Diet Coke can help you lose weight was quietly funded by Coca-Cola," Independent. Alicia Haskins at RHF CrossFit. CrossFit Level 1 Certificate Courses: CrossFit St Paul, CrossFit SouthEnd, CrossFit Petworth, CrossFit Carbon, CrossFit Morristown, I Am CrossFit Coconut Grove, CrossFit Columbus, CrossFit New West, CrossFit Laval, CrossFit Glasgow, CrossFit Lisses, CrossFit FRA, CrossFit Perth, CrossFit Long, CrossFit Cidade Jardim. CrossFit Level 2 Certificate Courses: Reebok CrossFit One, CrossFit Orlando. CrossFit Kids Course: CrossFit North Atlanta. Patti Tryal at Roanoke Valley CrossFit. Registration for the 2016 Reebok CrossFit Games Open is now live! The Tabata interval is 20 seconds of work followed by 10 seconds of rest for 8 intervals. Avoid lousy push-ups (see CFJ 7). For the Tabata squats, remain in the bottom position for the rest intervals, and immediately return to the bottom position after full extension. No resting at the top. Post number of squats completed. Choose the heaviest dumbbells and most difficult variant of the pull-up at which you can still complete a set of 21 reps. Try for each exercise to be completed unbroken. Post time, dumbbell load and type of pull-ups performed to comments. Jessica Estrada at CrossFit Jääkarhu. "Rethinking Weight Loss and the Reasons We're 'Always Hungry'," The New York Times. CrossFit Level 1 Certificate Courses: CrossFit Strong, CrossFit Silicon Valley, CrossFit Park City, Reebok CrossFit One, CrossFit Fury, CrossFit King of Prussia, CrossFit Belltown, CrossFit Colosseum, TRAIN Media City, CrossFit Basel, CrossFit Vienna The Loft, CrossFit Brisbane, RIG CrossFit, CrossFit Body in Motion HuangPu, CrossFit High Pulse. CrossFit Level 2 Certificate Courses: Iron Oak CrossFit, CrossFit Columbus, CrossFit Lutece, CrossFit 4TP. 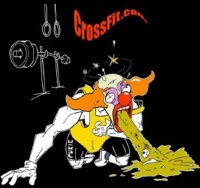 CrossFit Kids Courses: CrossFit Carbon, CrossFit Milpitas. Anberlyn at CrossFit Iron Sharpens Iron. "A Healthy Diet's Main Ingredients? Best Guesses," The New York Times. Buddy carry 2 laps on court or Sand bag if no buddy. Post number of rounds completed with 10 reps but don't stop until completed 20 min. U.S. Army Specialist Christopher "Gator" Gathercole, 21, of Santa Rosa, California, assigned to 2nd Battalion, 75th Ranger Regiment, based in Fort Lewis, Washington, was killed by enemy fire on May 26, 2008, in Ghazni, Afghanistan. He is survived by his brother Edward, sisters Jennifer Daly and Sarah Ferrell, father Edward Gathercole, and mother Catherine Haines.